In its quest for global cooperation in the fight against ISIS, the U.S. and its partners are turning to Iran for help. But it is the ayatollahs, not the caliphate, that the West should be worried about. For months, the world has been gripped by the spectacle of the rise of ISIS and overwhelmed by the group’s brutality. A race is on to find a solution to this latest “biggest problem” in the Middle East. And rightly so. ISIS is a metastasizing danger that must be degraded and destroyed. Dangerous as it is, however, the level of fear and panic over ISIS is not yet completely justified. And it is causing the international community to lose perspective and overlook a far more formidable foe and agent of regional and international instability: Iran. ISIS are murderers that bask in attention and fear; “a group of adventurers with a very aggressive ideology,” as Henry Kissinger has called them. Iran is a sober and calculating foe with global reach; the discipline of its loyal cadres and its quest for nuclear weapons make ISIS pale in comparison. In the inevitable fight between the West and ISIS, Iran must not be allowed to be the ultimate victor. Unfortunately, due to the crisis represented by the rise of ISIS, Iran is making major diplomatic gains. Long isolated from the West and under heavy recent sanctions due to its nuclear program, Iran now has a major Western lobby advocating for its inclusion in the international community. Former CIA case officer and analyst Robert Baer has said the U.S. must come to terms with Iran as a regional—and nuclear—power. Former senior director for Middle East Affairs at the National Security Council Flynt Leverett and his wife Hillary, a lecturer at American University, advocate an American rapprochement with Iran in order to salvage America’s strategic position in the Middle East. Bestselling foreign policy commentator Fareed Zakaria also recommended collaboration with Iran, which he sees as a beneficial “strategic game-changer.” He presented Iran’s influence over Iraq and its close relationship with Syrian President Bashar al-Assad as positives, recommending the extension of these alliances to Afghanistan. Quoting academic Vali Nasr, he essentially advised contracting out the United States’ “micromanagement” of the Middle East to the Islamic Republic. More significantly, perhaps, former British Foreign Minister Jack Straw has called on the West to take a “leap of faith” in order to reach a final nuclear deal with Iran that would allow it to keep a significant proportion of its existing centrifuges under international supervision. Without a hint of irony, he said that Iran was “fundamental” to establishing regional stability in Syria, northern Iraq, and—of all places—Lebanon. In light of a common threat from ISIS, he expressed hope that Prime Minister David Cameron has the foresight to recognize Iran’s utility. Iranian officialdom has echoed these sentiments. Brigadier General Yahya Rahim Safavi, one of Supreme Leader Ayatollah Ali Khamenei’s senior military advisers, said that America’s power and regional influence are in decline; and since Iran is the most influential player in the region, “the Americans have to give concessions to the powerful Iran because Iran has the upper hand.” Foreign Minister Mohammad Javad Zarif also noted Iran’s strategic role in combating ISIS and said that, absent his country’s assistance, Baghdad would have fallen to the Sunni Islamist group long ago. Iran is indeed a powerful and influential country, but it is no longer the Shah’s Iran. It is not a potential Western ally in a fight against another group of Islamists. This is because, according to the Islamic Republic of Iran’s foundational and unfaltering worldview, the West and all it stands for are mortal enemies. Iran’s enmity towards the West is therefore not contingent on concessions or attempts at rapprochement. It is a contest over the nature of the world order, on which the Iranian regime cannot and will not compromise. 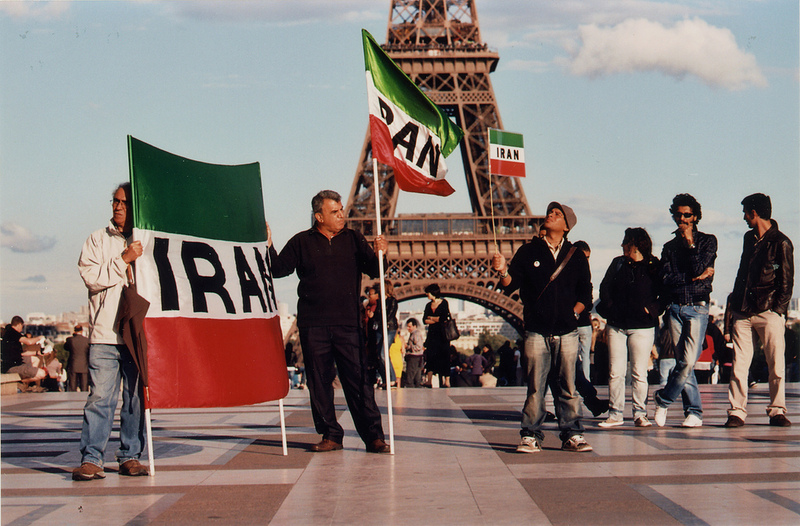 Most Westerners lack extensive understanding of the nature of the Iranian regime. It is a genuine Islamist Shi’a theocracy reflecting Ayatollah Khomeini’s particular interpretation of Shi’a Islam in his Vilayat-e Faqih (Rule of the Jurisprudent). It thus vests totalitarian power in its clerical leaders. At the moment, that power lies mainly with the current Supreme Leader (Rahbar) Ayatollah Ali Khamenei. He is the vali-ye faqih (“Jurisprudential Ruler”), and constitutionally the country’s ultimate religious, political, and military authority; he alone has the power to declare war and peace. More importantly, the Rahbar effectively decides who will or will not be the public face of his rule—that is, who will or will not be the president of Iran. Khamenei selects the 12 members of the Shura-ye Neghahban (“Guardian Council”), which is tasked with vetting and approving presidential candidates based on their allegiance to the ideals of the Vilayat-e Faqih. The Western media often calls Iranian leaders like ex-president Mohammad Khatami and current president Hassan Rouhani “moderates” or “reformers,” but the Guardian Council’s policies render such a characterization absurd. No genuine moderate or reformist candidate can get through the Council’s dragnet. In effect, then, the vetting process and the Rahbar’s ultimate authority negate any possibility of material change in Iran’s foreign or domestic policies. Iran’s governing ideology is not only totalitarian. It is also radically messianic. It considers obedience to the Rahbar to be equivalent to obeying the Hidden Imam al-Mahdi—the Twelfth Imam Mohammad al-Mahdi being the messianic figure in Shi’a Islam—and ultimately God himself. Disobedience to the Rahbar’s will is thus a crime against both the state and God. Since the reign of its founder, Ayatollah Ruhollah Khomeini, the Islamic Republic has adhered to those principles by carrying out waves of trials and executions, as well as the brutal repression of minority faiths, particularly the Baha’is. The Rahbar, moreover, is not merely absolute ruler but a player in the regime’s eschatology. He is considered a “caretaker,” leading the Islamic regime in the absence of Imam Al-Mahdi. Most dangerously, perhaps, the regime believes its task to be the hastening of the Mahdi’s return. In Iran’s foundational worldview, the West and all it stands for are mortal enemies. Attempting to partner with them is foolish and futile. These beliefs motivate Iran’s expansionist ambitions and generally violent outlook toward the outside world, especially the non-Muslim world. Like ISIS, Ayatollah Khomeini considered non-Muslim lands the “Realm of War,” and famously dubbed the United States the Shaytan-e Bozorg (“Great Satan”). He preached that jihad against the West is a religious obligation and necessary in order to export Iran’s revolution throughout the world. War against all non-Muslim countries, he declared, requires an epic struggle against “America, the global plunderer,” as well as “Zionism and Israel.” To Khomeini, all non-Islamic governments were inherently illegitimate. This, it should be noted, also includes the governments of all Muslim nations except Iran’s, because Iran alone has implemented “true” Islamic governance. Therefore, Iran’s mission is to spread Islamic governance worldwide—if necessary, by the sword. By doing so, Iran’s leaders believe they will hasten the Mahdi’s return and his subsequent establishment of worldwide Islamic rule. Chillingly, this religious imperative is also behind Iran’s pursuit of nuclear weapons. What nation could hope to conquer the world, after all, without the ultimate weapon? Less known, however, is that the same messianic and revolutionary imperative propelling its nuclear program has also driven Iran to become the world’s primary state sponsor of terrorism, with a continuously growing list of direct and proxy terror attacks. Its Iranian Revolutionary Guards Corps-Quds Force (IRGC-QF), tasked with extraterritorial operations, and its Ministry of Intelligence and Security, spearhead its terrorist campaigns. Iran also virtually gave birth to Lebanon’s Hezbollah, which has destabilized the region for decades to further Iranian interests. Hezbollah has seriously exacerbated sectarian tensions in Lebanon and, before 9/11, had the dubious honor of having killed more Americans than any other terrorist organization. Iran’s use of terrorism is ideological, but it is not only that. It is also used to achieve very specific goals: To further foreign policy ambitions, provide cover for intelligence operations, and create instability in the Middle East that Iran can exploit to its benefit. Over the past decade, Iran has increased its international terrorist activities and sponsorship, providing financial and military support to terrorist groups throughout the Middle East and Asia. Via IRGC-QF and Hezbollah, for example, it provided training in IED manufacturing and the use of advanced weaponry to Iraqi Shi’a militias targeting American forces. In another case, it plotted the assassination of the Saudi Ambassador to the United States. Iran has also increased its presence in Africa, destabilized Bahrain, and sown chaos in Yemen through its Houthi proxies. To advance the exportation and goals of its Revolution, Iran also cooperates with Sunni Islamists, despite the centuries-old rift between the two sects of Islam. In fact, former Iranian president Ali Akbar Hashemi-Rafsanjani and current president Hassan Rouhani—both often billed as moderates—developed and institutionalized Iran’s backing of Sunni Islamists in the 1980s and ‘90s, exploiting Shi’a and Sunni radicals’ mutual hatred toward America and the West to bring the sects together. Iran armed, trained, and funded Hamas and Palestinian Islamic Jihad, with PIJ endorsing Iran’s Islamic Revolution. Iran has funded the Taliban in the past, and in 2013, a terrorist plot was uncovered in Canada involving Iranian aid to Al-Qaeda. Iran wants power and influence, not regional stability. And the means to achieve that is through sowing chaos through terrorism. Needless to say, obtaining nuclear weapons would greatly increase Iran’s ability to further this goal, even if it opted never to use them. Indeed, to believe that adherents of a messianic and imperialist ideology would suddenly opt for peaceful coexistence immediately after obtaining the most powerful weapon ever developed by mankind requires a leap of faith even greater than that of the messianists themselves. Given all this, that Iran is now viewed as a lesser threat than ISIS—and even a potential ally against it—is a considerable accomplishment on the part of the Islamic Republic. And Iran has worked very hard to achieve it. Since Rouhani’s election, the Iranians have vigorously strived to present themselves as a benign force in international affairs. They have realized that conciliation, rather than confrontation, will bring them closer to their goals. Aside from the occasional chants of “Death to America”—old habits die hard—Iranian officials take great pains to look, dress, and sound like conventional politicians. They wear suits, work within the international system, and have expertly mastered the particular and peculiar jargon of diplomacy. Foreign Minister Mohammad Javad Zarif is Western-educated and cordially engages Western diplomats. Iran is a member of the United Nations, claims to respect international law, and sits on international councils that ostensibly condemn its violation. Unlike his belligerent predecessor, Hassan Rouhani flashes a charming smile, calls for bilateral engagement with the West, and has even acknowledged the horrors of the Holocaust. Even more intelligent is Iran’s decision to frame its positions in terms of long-accepted Western theories of international relations, even though their Vilayat-e Faqih-inspired form of Shi’a Islamism is opposed to all of them. Despite such carefully cultivated appearances, the truth is that the positions of men like Rouhani and Zarif are no different from that of their predecessors or Supreme Leader Khamenei. Only the presentation has changed. Insofar as their beliefs concern and affect us—setting aside the finer points of theological difference between Sunni and Shi’a Islam—the Iranians are not appreciably different from ISIS, but they are much smarter. On the surface, Iran is the antithesis of ISIS. It is rational and pragmatic, as we understand those terms. Their ideology is just as hostile to the West, but they pursue it under a veneer of respectability. ISIS has set itself apart and is identifiable as an enemy. But it is precisely that mirage of normalcy that makes Iran all the more dangerous. Like Greeks bearing gifts, they assert their country’s rights and privileges as a sovereign nation under a nation-state international system that they are, in fact, dedicated to overthrowing. It is a Trojan horse, working from the inside as an ostensible member of the club of respectable nations to destabilize the current world order. And in what may turn out to be Iran’s most chillingly brilliant maneuver yet, Iran is now seizing on the golden opportunity presented by enmity toward ISIS that it and the West coincidentally share. Iran is now deftly exploiting the current crisis in Iraq and Syria in order to break out of its international isolation, obtain the lifting of sanctions, and convince the West to be more flexible on its nuclear program. The Islamic Republic is using every means in the international system while simultaneously subverting it and working to bring it down. The Iranians are working this angle for everything its worth. Realizing that Iran is now perceived as a lesser threat than ISIS, President Rouhani has repeatedly denounced the terrorist group’s savagery and called on the world to fight them. Along with a stick, he offers a carrot, expressing optimism about Iran’s warming relations with the United States; saying that a closer relationship between the two countries would help combat ISIS and stabilize the region. Iran is also playing the double game of signaling its openness to cooperation with the West against ISIS—for a price, of course—while doing everything it can to exaggerate the threat posed by the terrorist group. It does so precisely because this draws international attention away from Iran. Capitalizing on the general mood of the international community, Rouhani’s speech at the UN General Assembly stressed that ISIS is the real threat to international security, not Iran or its nuclear program. He attacked ISIS as beyond the pale of the civilized world—of which Iran, he implied, is an integral part. His message was that confronting ISIS requires cooperation with the Islamic Republic, a point he repeated in a recent interview. Only “delusional Iranophobia,” he says, fuels fears of the Islamic Republic. The Iranian strategy is therefore quite clear: Increase Western desire for Iranian assistance against ISIS in order to procure concessions on the country’s nuclear program. Iran’s leaders believe that, as the ISIS situation worsens, the West’s fears will heighten and it will become more amenable to concessions in order to secure Iran’s help. The West is increasingly receptive to this endlessly repeated message. This is because it believes it cannot focus on the immediate threat from ISIS if it does not resolve the distracting issue of Iran. All Iran needs to do is keep applying pressure and wait. This strategy seems to be bearing fruit. Indeed, even before the rise of ISIS, American policy towards Iran began to slowly but noticeably shift. 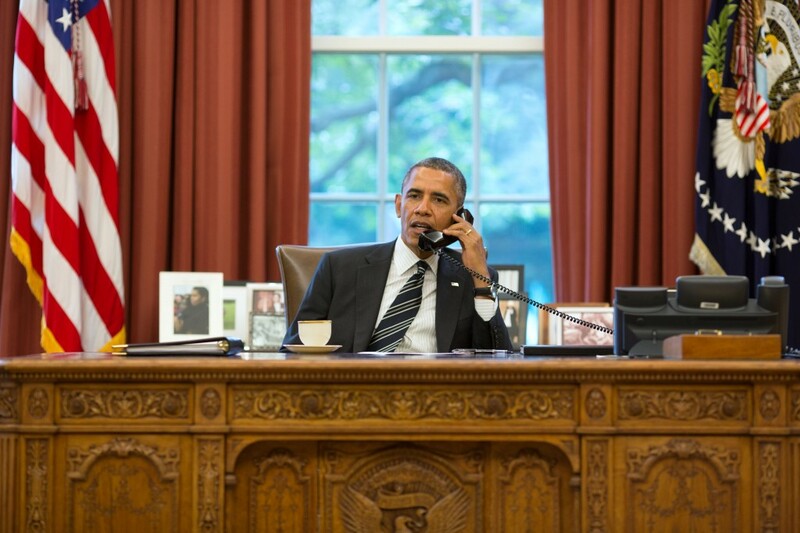 The Obama administration began softening sanctions on Iran months before recent nuclear talks in Geneva or the historic phone call between Obama and Rouhani. The Treasury Department significantly slowed down the pace with which it designated entities and people, helping the Islamic republic evade international sanctions. And the administration has vigorously opposed the passage of new sanctions in Congress. It seems that the idea that Iran is reforming as a direct result of Rouhani’s election has gripped America’s halls of power. At least some important people in the administration have bought what Iran is selling. As the ISIS threat has increased, so has the pace of American-Iranian rapprochement. The Americans want to resolve the Iranian issue in order to have a free hand—and support—in fighting ISIS. Since last September, the United States has been directly engaging Iran in bilateral meetings between its three highest-ranking diplomats—for the first time since the 1979 revolution—over Iran’s nuclear program. But these meetings have increasingly become about ISIS. Secretary of State John Kerry has spoken highly of these meetings. Kerry has vacillated on the question of military cooperation with Iran. He recently ruled it out, but this contradicted an earlier statement indicating openness to the idea. But Kerry has been consistent in sending out the message that Iran is part of the solution, and that the United States is not opposed to Iranian assistance in some form. While he rejected direct Iranian involvement in the anti-ISIS coalition meeting in Paris, he did say that Iran has a role in the fight and that methods of cooperation were being discussed. He repeated this point in a recent meeting with Zarif, though Iran denied that the two discussed the subject. President Obama’s latest UN General Assembly speech was also notable for its extremely passive attitude toward Iran. The Islamic Republic received a passing, benign mention that sounded more like friendly advice than criticism. Contradicting his point that Islamist extremism can only be answered with force, he emphasized that the United States was pursing negotiations with Iran—a regime founded on Islamist extremism—to resolve the nuclear issue, meet Iran’s energy needs, and assure the world that its nuclear program is peaceful. He also noted that Sunni vs. Shi’a warfare has wrought havoc across the Middle East, mentioning Iraq and Lebanon. But he failed to point out Iran’s well-known role in this havoc. These, one could argue, are only kind words. But the U.S.-Iran rapprochement might not be confined to kind words alone. Iraqi President Fouad Ma’sum recently told CNN’s Christiane Amanpour that the United States and Iran are privately cooperating against ISIS, a claim that has been seconded by some Iranian officials. Though both the Iranian Foreign Ministry and the U.S. State Department sharply denied a BBC report that Ayatollah Khamenei had authorized cooperation with the United States, State Department spokesperson Marie Harf stressed American openness to engaging Iran on the issue. More significantly, despite the denials of coordination, reports confirmed by a senior Iranian official indicate that the U.S. gave Iran advanced warning of its strikes against ISIS in Syria. According to the Iranian official, Iran had expressed concerns that the Assad regime might be weakened as a result of American air strikes, and the U.S. assured Iran that Assad’s forces would not be targeted. The State Department qualified this by saying that only intentions, not operational specifics, were shared. Yet, the very fact that the United States feels the need to assuage Iran’s fears reflects a newfound perception of Iran as part of the solution. Iran has been quite honest about why it is cooperating with the West against ISIS—it helps them reach a nuclear deal on their terms. And that is precisely the problem. At the moment, the fight against ISIS is playing into Iran’s hands. Including Iran in the fight against ISIS and confronting ISIS without simultaneously confronting Iran inadvertently facilitates the exportation of Iranian ideology and influence. And it does so without the Iranians having to lift a finger. Direct cooperation would be even worse. It would allow Iran to expand and entrench its hold on Iraq and Syria under the umbrella of US firepower. The United States’ assessment of Iran as a regional stabilizer must be revised in order to prevent that. Iran’s goal is to obtain regional hegemony—expanding its control over territory across the “Shi’a Crescent” and obtaining nuclear weapons are incremental moves in that direction. They must be actively combated, not facilitated, by the United States. 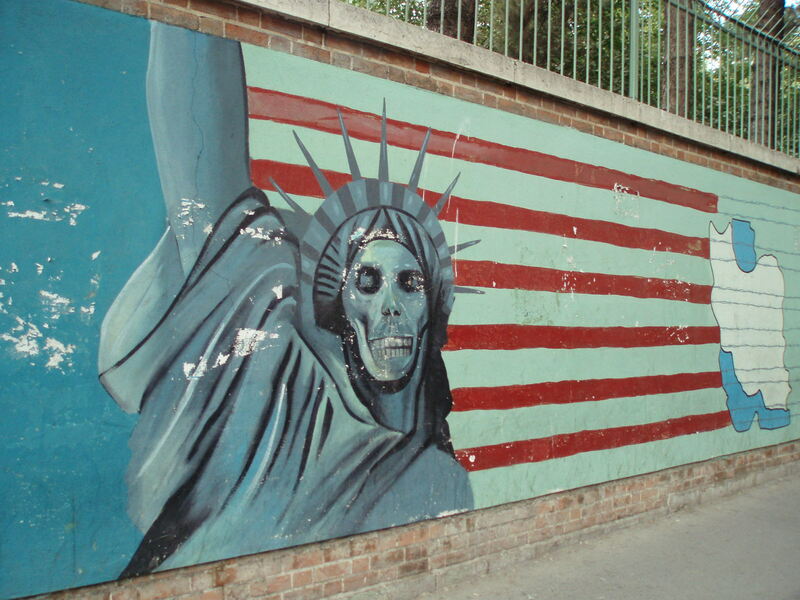 At the moment, however, the U.S. seems to be turning a blind eye to Tehran, allowing it to do as it pleases. The United States is not the only power engaging Iran. UK Prime Minister David Cameron recently held a private meeting—apparently requested by London—with Rouhani at the United Nations. Leading up to the meeting, Downing Street issued a statement saying that, despite apprehensions over Iran’s nuclear program, the UK is leaving open the possibility of cooperation with Iran against ISIS. Whatever the outcome of the meeting, it was the first of its kind since 1979, and clearly signaled a thaw in relations between Iran and the United Kingdom. 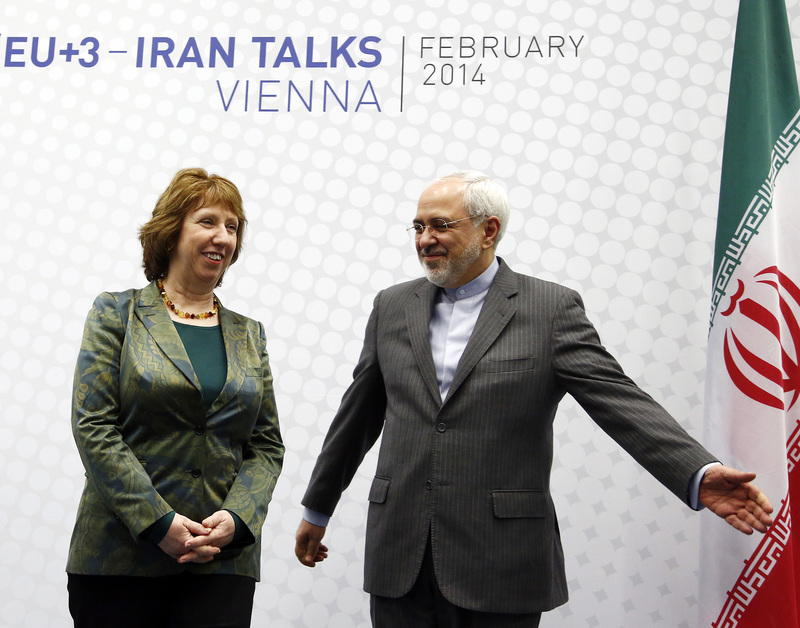 The meeting was spurred by a troubling shift in British policy on Iran. There is a perception that progress is being made on the nuclear talks, making Iran a lesser threat when compared to the escalating ISIS problem. By holding the meeting, the UK sent a strong message to Iran that it desires a change in the two countries’ relations in order to incorporate Iran into the UK’s anti-ISIS strategy. Cameron’s UN General Assembly speech seemed to confirm this by framing ISIS as the prime threat to world security. He called for an inclusive strategy which would admit any partner in the region willing to be part of the solution, “including Iran,” saying that Tehran should be given a chance to be part of the solution. European powers, too, are capitulating to Iran, and some Gulf states may be next. The problem with this is that it would leave Iran a virtual nuclear power. Whether Iran actually builds and tests a nuclear weapon or retains the capability to do so quickly is irrelevant—the effect would be the same. A virtually nuclear Iran will have achieved that status in defiance of the most comprehensive sanctions ever imposed on any country. The success of that defiance would demonstrate the ineffectiveness of sanctions in general. This will lead other regional actors who would otherwise have been deterred to follow suit. In addition, Iran and its proxies would have a free hand to act with impunity against Israel and the West via conventional weapons, due to the deterrence achieved through its nuclear capacity—virtual or actual. There is also the simple fact that Iran could achieve nuclear breakout capacity without anyone knowing it. Given Iran’s track record so far, this is not farfetched. France has also gotten into this game. Rouhani has met with President Francois Hollande, whose country is a key member of the anti-ISIS coalition. Among other things, the two discussed the situation in Iraq and Syria and, ironically, exchanged views on how to cooperate on combating terrorism. Hollande suggested to Rouhani that France considers Iran a potential ally in the fight against ISIS and needs Iran’s help. In his General Assembly speech, Hollande did not mention Iran at all. This could signal a French about-face from what analysts saw as an alignment with Israel and Saudi Arabia against the Iranian nuclear program. Hollande had previously taken an even more hawkish stance on the Middle East and Iran than the United States. Last year, for example, he was the strongest voice calling for attacks on Iran’s Syrian ally, President Assad. Last November, the French were rumored to have scuttled a “sucker’s deal” with Iran over its nuclear program, insisting on concrete and verifiable Iranian concessions on the issue, stressing that the time for negotiations is not unlimited. Most striking is the case of Saudi Arabia. Just a year ago, Saudi-Iranian rapprochement was unimaginable. But ISIS has made the two countries into strange bedfellows. The rivals started sending out feelers when Iraq began to deteriorate, and relations picked up speed after ISIS’ shocking victories last June, when it captured Mosul and declared the establishment of a caliphate. ISIS also posed a serious threat to Lebanon—a country of interest to both Iran and Saudi Arabia—when it invaded the town of Arsal in early August. Later that month, Iran’s Deputy Minister Hossein Amir Abdollahian visited Riyadh to improve ties and discuss matters of importance to both countries, which presumably include ISIS. In September, Iran and Saudi Arabia held their first foreign minister-level talks since Rouhani’s election. Both foreign ministers called for cooperation against ISIS in order to achieve regional stability and security. Taken at face value, this is a complete reversal from the enmity and mutual recrimination that have characterized Iranian-Saudi dealings in the past. Riyadh had previously accused Tehran of fomenting trouble in the Gulf and called on the United States to strike Iran’s nuclear sites in order to “cut off the head of the snake.” Iran in turn accused Saudi Arabia of colluding with the United States in order to destroy the Islamic Republic. Rouhani also recently discussed bilateral cooperation with Afghanistan’s new President, Ashraf Ghani Ahmadzai. Cooperation, Rouhani said, is “the main way for countering terrorism, and tribal and ethnic extremism.” He also spoke approvingly of the new U.S.-Afghani Security Agreement. In response, Ahmadzai assured Rouhani that security arrangements with the United States would not harm relations with Iran, because mutual assistance is necessary to combat Islamist extremism. But Iran does not just want to expand its friends list. It wants tangible gains, and it is playing hardball to get them. Among other tactics, Iran has linked its cooperation against ISIS to its nuclear program. As the November 24 deadline for negotiations on the issue approaches, Iran is making it increasingly difficult to keep nuclear negotiations separate from other regional issues, demanding a quid pro quo for cooperation against ISIS. What’s happening is quite clear. Iran is using the fear of ISIS to relax tensions with the West and obtain concessions on its nuclear program. Iran is now even insisting on expanding its uranium enrichment capacity beyond its current infrastructure. Khamenei recently called for a marked increase in Iran’s enrichment capacity. Zarif told The New York Times that Iran would not dismantle any part of its nuclear infrastructure, leaving it with 19,000 active centrifuges. The most it would do is cap the program for up to seven years. Zarif was even more forceful recently, insisting that the West must not even contemplate the idea that Iran would give up its nuclear rights. This would allow Iran’s nuclear program to continue—subject to inspections—without making a single significant concession on the issue. The Iranians feel emboldened by the change in the international community’s mood. As a result, they have upped the ante. Their emphasis has shifted to moving the West’s “red line” to the production of warheads or curtailing centrifuges to a level that would still allow for a substantial military capacity. So far, the West has resisted Iranian efforts to establish the direct quid pro quo demanded by Tehran. White House officials say that ISIS and Iran’s nuclear program will remain entirely separate issues. But this is little cause for comfort. The already tepid Western resistance to Iranian demands might weaken as the ISIS threat grows or if it carries out successful attacks on Western soil. The Iranians are playing on that fear with great skill, and have indicated that their help on ISIS will not be as forthcoming without a nuclear deal acceptable to them. Secretary Kerry picked up on this threat and, despite insisting that the nuclear issue would not be conflated with ISIS, said that “strange bedfellows” are inevitable in the fight against the Islamist terror group. Tellingly, when Kerry met Zarif in late September, a discussion that was intended to focus on Iran’s nuclear program turned into talks about confronting ISIS—and the two agreed to meet again on the matter as needed. None of this bodes well for the future. Especially because, even without the ISIS issue involved, the West’s record on the nuclear issue is not a good one. 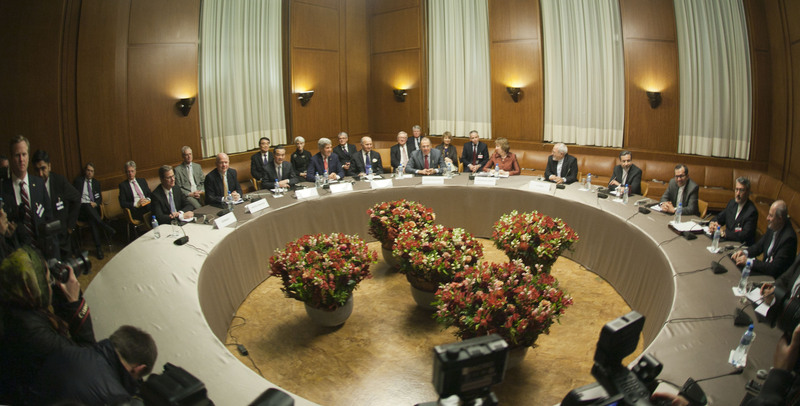 There have been six unanimous Security Council resolutions against the program, the IAEA and the United States have demanded an unconditional halt to Iranian enrichment, and endless statements have been made about leaving all options on the table to prevent Iran from going nuclear. Yet, over the last ten years of negotiations, the Islamic Republic has steadily advanced towards becoming a nuclear power, and the West’s position has steadily softened. In 2003, at the start of negotiations, Iran had 130 centrifuges and no capacity to produce fissile material. In 2014, Iran admitted possessing seven tons of low-grade enriched uranium. It now has 19,000 centrifuges and can transform them into weapons-grade material in mere months. This is enough to build seven to ten Hiroshima-type bombs. The West has responded to this with a series of ever more permissive proposals: Permanent termination of uranium enrichment (2004); continuing some enrichment at low-enriched uranium levels (LEU), i.e., less than 20 percent (2005); shipping most of its LEU abroad to be turned into fuel rods with 20 percent enriched uranium, in addition to dropping the initial insistence that Iran halt fuel-cycle activities before proceeding to negotiations (2009); and allowing Iran to keep enough 20 percent enriched uranium to run a research reactor while only suspending operations at its Fordow facility, despite previous demands that the facility be shut down (2013). At that point, Iran promised to give up half of its 20 percent enriched uranium through a circuitous route, pledging to convert it into a form which could easily be reconverted to its original form, and it has retained the means of doing so. The latest proposal would have Iran disconnect, rather than dismantle, many of its uranium-enrichment centrifuges, which would barely put a dent in the program. David Albright and Olli Heinonen, two leading nuclear experts, said that reconnecting the centrifuges could take mere months. But Iran has rejected even this very minimal concession. What’s happening is quite clear. Iran is using the fear of ISIS to relax tensions with the West and obtain concessions on its nuclear program. In return for Western concessions, Iran has not taken any significant confidence-building measures whatsoever. Just this year, the IAEA’s September report stated that Iran failed to explain recent research on nuclear detonators or calculations on the explosive yield of a nuclear weapon. Iran also barred UN inspectors from visiting a military site suspected of testing nuclear components. According to Israeli intelligence agencies, Iran has been secretly using its Parchin military site to test technologies that can only be used for detonating nuclear weapons. Israel’s Minister of Intelligence, Yuval Steinitz, has noted that Iranian’s inflexibility on keeping their centrifuges in place or dismantling its heavy water reactor at Arak creates a “gloomy” picture. This progressively weakening Western position has given Iran little incentive to treat any demand as final or serious. At each stage, it has cast itself as less interested in a solution than the West and invited it to make new concessions. For the most part, the West has complied. It seems, in fact, that Iran is essentially trying to push the West into giving up and approving of its nuclear program. Current trends, with the steady approach of the November 24 deadline, and the West’s increasing desire to square away the Iran issue in order to deal with ISIS and possibly secure Iranian cooperation, might lead to that result. Despite the rumors and reports, however, it is unlikely that direct and intentional cooperation is underway between the West and Iran. Instead, the focus on ISIS and the increased perception of Iran as benign has caused the West and Iran’s other foes to let down their guard. A cartoon summarizing the situation recently appeared in the Lebanese Daily Star. It shows President Obama opening a box labeled “Cooperation Against ISIS,” only to be shocked when an Iranian jack-in-the-box leaps out at him. By combating ISIS and ignoring Iran, a “back door” may be inadvertently opened, through which Iran can restore and tighten its grip over Iraq, Syria, and Lebanon, reconstituting the hard-earned “Shi’a Crescent” that was weakened by the rise of ISIS. What happened at the northern Iraqi town of Amerli should serve as a warning. In August, President Obama authorized military strikes to support Kurdish militia forces fighting to break ISIS’ stranglehold on the Shi’a town. But it inadvertently played into Iran’s hands by allowing Iranian-backed Shi’a fighters to retake the site. University of Maryland researcher Phillip Smyth noted that these fighters are under Iranian patronage and adhere to its ideology. They are completely loyal to Khamenei, intent on furthering the Iranian revolution, and dedicated to executing Iran’s will in the region. 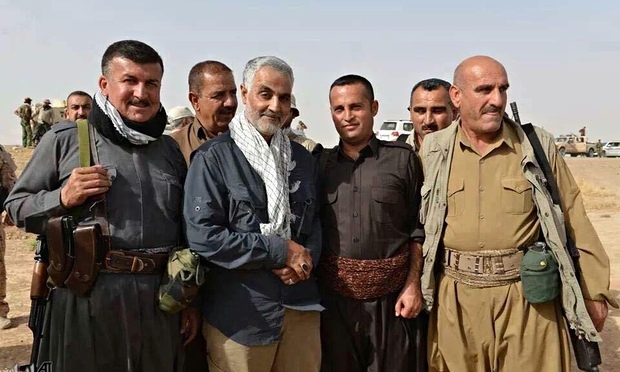 Smyth also discovered that the IRGC-QF’s commander, Qasem Soleimani, was on the ground directing the fighters. Iran also scored a psychological victory, with many Western analysts billing the Islamic Republic as “the one power [emphasis own] capable of stanching ISIS’s advance.” In other words, ground lost by ISIS was gained by Iran—meaning that, either way, the West lost. If the West keeps turning a blind eye to Iran, it risks Amerli becoming a microcosm of the entire war against ISIS, stretching beyond the borders of Iraq. There is no need to minimize the ISIS threat. There is no doubt that it is an extremely dangerous organization. But it must also be put in perspective: ISIS is flashy. It basks in the publicity gained by its public acts of brutality. And its goal is to grab attention and terrorize, hoping to inspire like-minded Islamists to join its cause. It has horrified the world. But it is more form than substance. Iran, by contrast, hides behind a respectable veneer of moderation. It has 39 years of diplomatic experience—built upon a millennia-old tradition of Persian statecraft—and the finesse and subtlety that come with it. It knows how to speak its enemy’s language and use the rituals and consensus beliefs of the international community to its advantage. As a result, it is far more dangerous than ISIS. ISIS and Iran have theological differences, but insofar as their ideology directly concerns and affects us, there is little appreciable difference between them. Sunni and Shi’a Islamists agree about overthrowing the current world order and pursuing an imperialist agenda that they believe will end in a world dominated by an Islamic empire. The only major difference is the nature of the apocalyptic endgame. In a nutshell, Iran’s ruling Shi’a Islamists believe it will end with the return of the Mahdi, who will assume the powers that the Rahbar temporarily exercises. Sunni Islamists disagree. In simplified form, that is all. Certainly, ISIS must be destroyed before it becomes a permanent geostrategic reality. But to destroy ISIS while allowing Iran to reassert regional hegemony would be to win the battle and lose the war. ISIS’s ideology is aggressive and dangerous, and they must not be allowed to become what Iran currently is. At the same time, however, Iran must not be allowed to exploit the fight against ISIS to get even one step closer to its nuclear ambitions or to establish a stranglehold on the region. The West must go on simultaneous offensives against Iran and ISIS. Dismantling Tehran’s nuclear program must be coupled with equally strong measures aimed at crippling its support for terrorist organizations and rolling back its destabilizing influence on neighboring countries. After Iran is contained, its abysmal human rights record—which differs very little from ISIS’s brutality—must be addressed head-on. Put simply, Iran is not a partner. In this case, the enemy of our enemy is emphatically not our friend. And in the end, the only way to stop Iran’s regional—and ultimately global—ambitions is for the regime to be completely dismantled. The stability of the Middle East and international security depends on it.